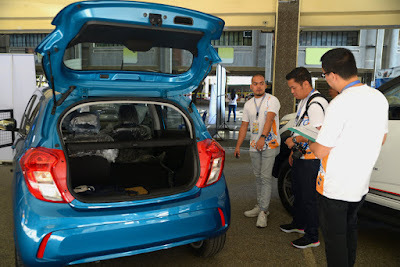 The Covenant Car Company, Inc. (TCCCI), exclusive importer and distributor of Chevrolet automobiles and parts in the country, holds its annual Chevrolet National Skillsfest last March 2, 2019 at Don Bosco Technical Institute of Makati, with 34 participants from the 27 Chevrolet dealerships nationwide. The Chevrolet National Skillsfest is a testament to the bow tie brand’s commitment in delivering the best ownership experience and support for Chevy customers through its comprehensive owner benefit program – Chevrolet Complete Care. Sales Consultants, Group Retail Managers, General Sales Managers, Service Advisors, Service Technicians, and Parts Consultants went through a three-part assessment to test their knowledge, skills, and technical abilities in Chevrolet products and services. The sales methodology included a six-point walk around station to further test the product knowledge and ability to adapt to real-life scenarios such as product and sales demonstration until delivery to the customer, featuring the Chevrolet Trailblazer, Colorado High Country Storm, and Spark vehicles. In the aftersales methodology, multiple stations gauge various competencies in inspecting engine system and chassis system components, diagnostic abilities and correct usage of tools. Role-play evaluations examined consulting skills, excellence in customer reception, and familiarity in multi-point inspection. The champions for this year’s Chevrolet National Skillsfest will be announced in the upcoming Chevrolet Grandmasters in May.